Jennifer Allora & Guillermo Calzadilla, Returning a Sound, 2004. Video. Vieques is an island off the mainland of Puerto Rico used by the U.S Navy and NATO forces as military testing ground as from the 1940s. Civil disobedience and active protest movements initiated by local inhabitants and an international support network led to the end of the bombings and progressive demilitarization in 2002. Allora & Calzadilla became involved in the defense of this cause in 2000 and made a series of works relating to the story of this island. This video demonstrates the beginning of their ongoing interest in the interplay between militarism and sound. In Returning A Sound, Homar, the motorcycle driver and activist, drives around the island as if reclaiming the territory. 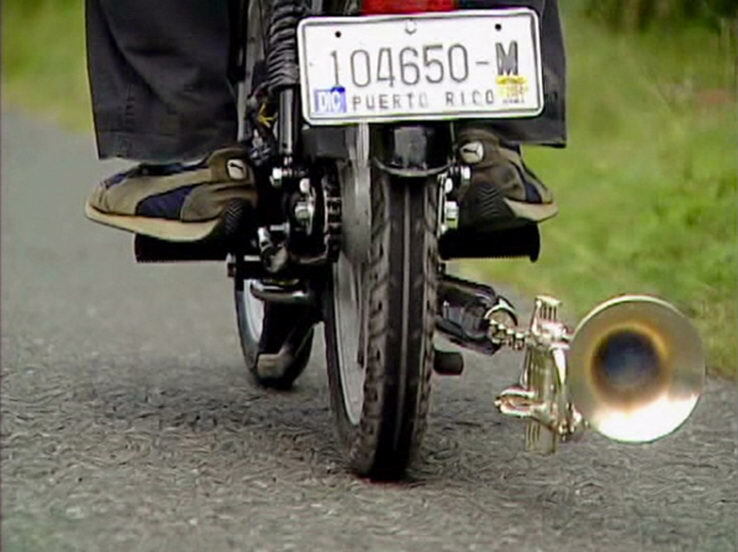 The muffler was altered so it no longer silenced the noise and became a musical instrument instead, like a trumpet to announce decontamination and recovery in echo to the terrible exploding sounds that had shaped the lives of the Vieques inhabitants for 60 years. “As artists, we became interested in questions related to the sonic violence that marked this space, as it was exposed to earsplitting detonations up to 250 days out of the year. The first work we made in that regard was Returning A Sound, which we filmed just after the military lands were semi-opened to the public in 2003.” Guillermo Calzadilla, quoted in Carlo Motta, “Allora & Calzadilla”, BOMB magazine, 109, Autumn 2009.